Why did Zynga generate revenue of $332 million versus the analyst-projected $344 million, earning 3 cents per share instead of 5 (and sending the stock off 40% in after-hour trading)? Three big factors, the company said today on the earnings call, in the following order: Facebook platform changes, game launches late in the quarter, and Draw Something’s weakening mobile traffic. Facebook began emphasizing new games in its news feed, notifications, bookmarks and other communication channels at the expense of existing games, chief operating officer John Schappert said. This sent existing games down 15% across the platform (not just Zynga games) and live-action genre games down 34%. Because so many users engaged less often, they bought fewer virtual goods, driving down gross bookings by 9% for the quarter. The issue for Zynga is that it has so far used its existing portfolio to help drive the growth of new games. This asset could continue to lose relative value, forcing it to rely more heavily on new launches, its $1.6 billion in cash, and its users outside of Facebook to boost numbers. On to Zynga’s second point, which is kinda part of the first. The company said its launches last quarter happened so late that the benefits aren’t showing up here. So we’ll see for Q3. 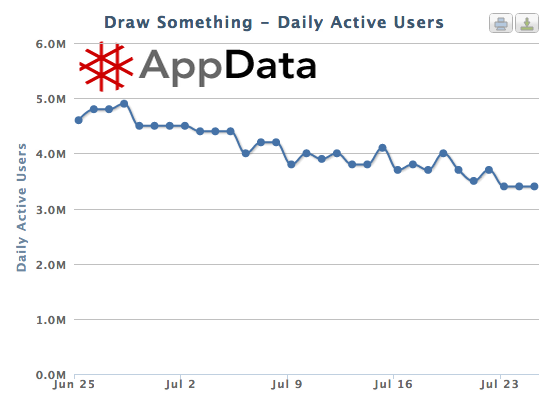 The third factor is Draw Something, the iconic mobile game from OMGPOP, which Zynga bought for $180 million in March. The company now has 3.4 million daily active users, according to AppData, a fraction of the 14.6 million DAU it had at the time of the acquisition. Chief executive Mark Pincus said that the company still believed that the game’s “evergreen” promise, for what it’s worth. Overall, Zynga continues to see its audience shift towards mobile — 33 million DAU versus 77 million DAU — and continues to monetize mobile users at less than half the value of its web users. Pincus said that mobile and its own cross-platform platform are going to be the biggest sources of growth. Incidentally, our CrunchUp event happening in Silicon Valley next week will feature Facebook discussing how its developer ecosystem is changing, and in particular adapting to mobile. You can bet we’ll be talking about Zynga and these issues in detail.